Just in case you have a hankering for some tasty fast food/take out dishes I have included a food court favorite- Bourbon Chicken. It is so easy and deliciously sweet- all you need is a big bowl of rice to put this Bourbon Chicken Slow Cooker Freezer Meal on and you are set for a great supper! While bourbon is a key ingredient for traditional flavor in this recipe if you have none on hand or don’t want to use it you can substitute in the same amount of broth and it will still be pretty darn good.I have made it this way several times when i didn’t feel like running out for bourbon. 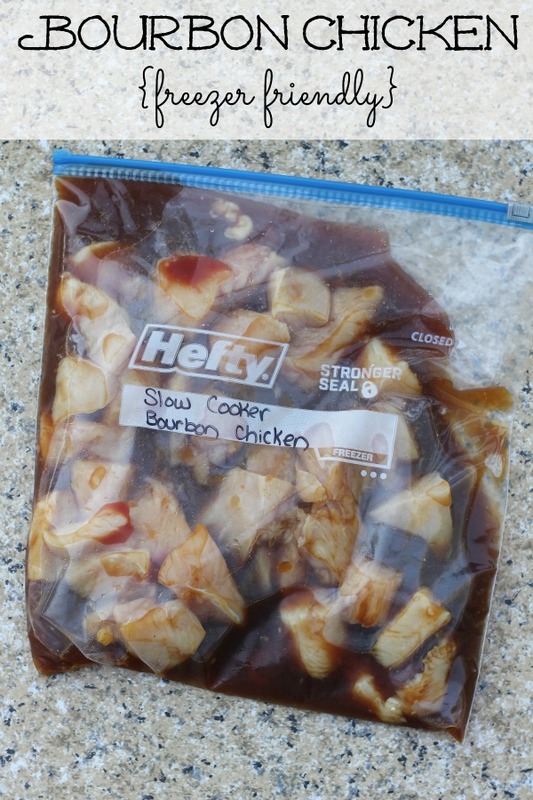 Label gallon freezer bag with contents, date, and cooking directions. Cut chicken into small bite sized pieces. In freezer bag whisk together brown sugar, ketchup, soy sauce, cornstarch, apple juice, apple cider, bourbon, garlic, ginger, and black pepper. Add chicken, shake bag to coat. Press flat, seal bag securely. 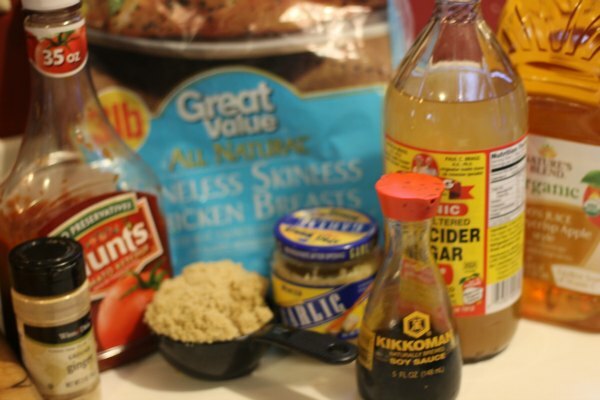 Pour chicken and sauce into a slow cooker that has been coated in nonstick cooking spray or lined with a slow cooker bag for easy clean up. Cook on low for 6-7 hours, stirring occasionally. Serve over rice, add fresh steamed broccoli or another favorite veggie for a complete meal. Tried this today and can’t say it’s nice. Yuk, won’t be making it again. How would you recommend cooking the sauce prior to putting everything in the crock pot? Hello. Firstly, I read the comments above and found them to be extremely helpful. Thank you. I used Evan Williams bourbon – the guy at the store said that was good for cooking. In the recipe I used 1/3 cup of the bourbon to reduce the alcohol taste, and used the suggestion of cooking the sauce beforehand. So, I cooked off the alcohol smell, and have a sauce that is tangy and sweet with the bourbon flavor. Hope that helps. It is now in the crock-pot for 6 hours and the sauce can finish thickening. Update to my previous comment. After 6 hours in the crock pot, it was delicious. The chicken was very tender. Ate it over rice. Very good flavor – not tasting of alcohol at all. Sweet, tangy and tasty. So, I’m giving this a whirl…I’m half way through the cooking (3 hours in) and the sauce seems really runny. Does the sauce turn thick and sticky? I know I still have some cooking to do, but I’m worried. Also, I had a really hard time getting this to freeze…mostly because if the alcohol I think. Did you run into this problem?! Ahh! I cooked on low for 7 hours and it came out tasting super strong of alcohol! Any idea what I can do to possibly use this recipe in the future (with the Bourbon) and have a better outcome? Maybe try cooking the sauce prior to freezing on the stovetop to reduce out the alcohol but leaving the flavor?